Unplugging the “Christmas tree”: what happened to high-redshift clumps of star formation? Happy Ides of March! 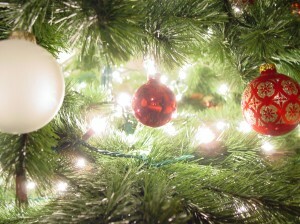 If you have yet to take down your Christmas tree, it is probably time to do so. The Universe has set a good example with its own spring cleaning: it seems to have taken down the “Christmas lights” of galaxies over time. Now that we can study the distant Universe at high resolution, it has become clear that galaxies looked quite different in the past, with irregular knots or clumps of star formation popping up at random locations within them. These bright clumps which are fairly ubiquitous at high-redshifts are mysteriously absent in the local Universe. Historically, galaxy collisions were thought to be the prime suspect for triggering this star formation; however, recent evidence suggests that these major mergers are as not as prevalent as we once believed. Thus, we are left with two questions, namely, where did these clumps come from, and where did they go? Let’s start with the theory, and explain all of this holiday talk. As discussed in this astrobite, the lack of observed major mergers has prompted discussion of inside-out growth, that is, galaxies building up their stellar populations starting in the inner regions and gradually moving outwards. Why would this happen? In brief, we know that typical star formation rates were significantly higher in the past – so high that galaxies would need an external supply of cold gas in order to fuel the creation of all of their stars. Models predict that this cold gas accretion would gradually increase the size of a galaxy, hence, the galaxy would grow over time, creating new stars at its outer edges. As for the Christmas tree model: while this gas accretion process would predominately create a smooth distribution of stars (the tree), slight gravitational instabilities could create clumps of enhanced star formation (the lights). This is akin to the more familiar density waves that are responsible for the increased star formation rates and thus blue color of spiral arms in local galaxies, but these clumps are isolated patches of higher density as opposed to a long-lived pattern. When the massive stars explode as supernovae, the injection of energy breaks up the clumps, letting them blend back into the rest of the galaxy and shutting off the lights. This model of clump formation and breakup answers both questions theoretically, but does this picture match the observations, and, if so, is it the only plausible solution? The authors of this paper set out to investigate just that. They consider a sample of about 600 galaxies from the CANDELS survey, which they divide into two roughly equal bins of redshifts near z~1 (~8 billion years ago) and z~2 (~10 billion years ago). For each of these galaxies, they have Hubble Space Telescope images in 7 different bands using the Wide Field Camera 3 (WFC3) and the Advanced Camera for Surveys (ACS). The exquisite resolution of this data allows Wuyts et al. to examine variations in color within the galaxies (Figure 1). As expected, they find off-center clumps are present at shorter (bluer) wavelengths, indicative of young stars, but absent at the longer (redder) wavelengths which trace older stars. The change in the inferred stellar distribution implies that the clumps are necessarily quite young – if there had been prolonged star formation in those areas, then the density of older stars should also be enhanced. So far so good. Tree: check, lights: check. However, the authors do more than compare colors; they also model the mass distribution of each galaxy. To do so, they employ a technique called population synthesis modeling (see this astrobite for a more detailed description). Generally speaking, a population synthesis model takes a starting distribution of stellar masses – an initial mass function (IMF) – and lets those stars evolve in an attempt to produce the colors actually observed in the galaxy. Here, the authors primarily use a star formation rate that declines exponentially over time (a fairly common assumption) and a Chabrier IMF (see this astrobite), leaving the mass, amount of extinction from dust, characteristic timescale for star formation, and galaxy age as free parameters. Notably, their result for the mass does not show any density enhancements as the blue stars do, suggesting that the clumps are not more dense than their surroundings (Figure 1, right-most panel). Nonetheless, the authors caution that some extra mass may be hidden from the model by ongoing intense star formation in the clumps. 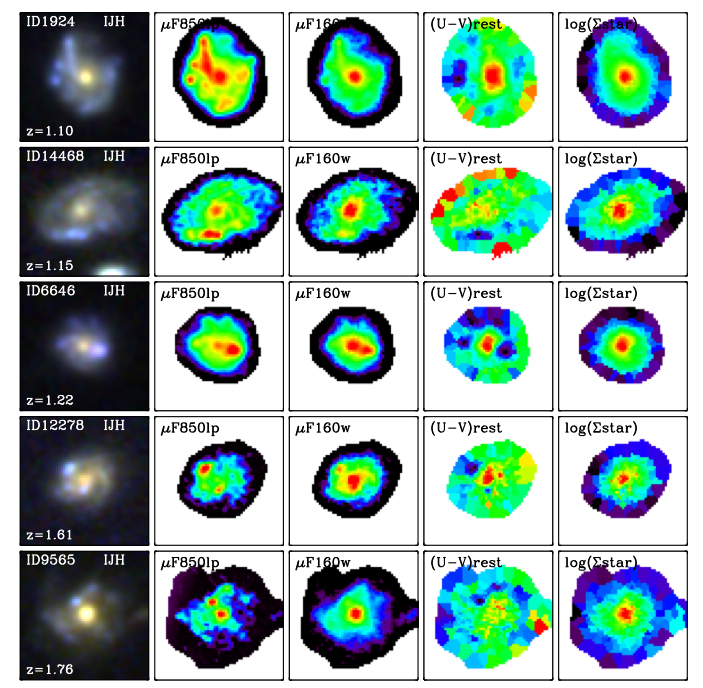 Figure 1: (From left to right) 3-color images, rest-frame blue, rest-frame red, color maps, and mass surface density maps for five galaxies within the sample. What about the global properties of the galaxy, aside from the clumps themselves? As evident in Figure 1, the centers of these galaxies are redder than their disks, and the mass surface density is greater in the center as well. This could mean that the galactic centers contain only redder, more evolved stars, or that the bluer light is obscured by a dusty central region. Happily, both of these situations could be explained by inside-out growth. While the first option is more obvious, the presence of dust would imply that stars have had the time to evolve and deposit heavy elements back into the galaxy; thus, in either case older stars would live at the galaxies’ centers. While this may seem to put together a convincing argument for “Christmas tree” galaxies, there is an another scenario that is also consistent with the data. This theory suggests that instead of the clumps spending their short lives at the outskirts of the galaxies and blowing apart in supernovae, they are instead slowed by frictional drag and migrate inwards, building up the central bulges of these galaxies. This could help to explain how bulges form in the absence of mergers, which is an open question. While this clump migration is not inconsistent with inside-out growth, it would not provide as strong evidence for it as it would in the first case. Thus, the origin and fate of clumps in high-redshift galaxies remains a subject of debate.